Pattern Description: A series of arches, one over the other reach from the base to the top. 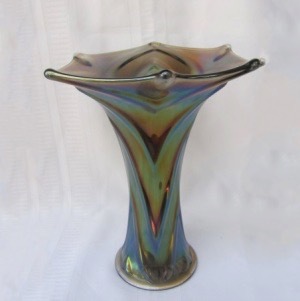 The top of the vase comes to six points. Every other point is the top of an arch. Gothic Arches was probably named for the art deco pattern design, which is made up of overlapping arches covering the shape. 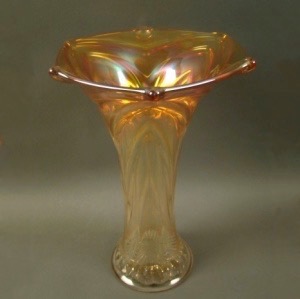 Only reported in a base size, the top of the vase has 8 points, 4 of them are the continuation of the arch pattern. 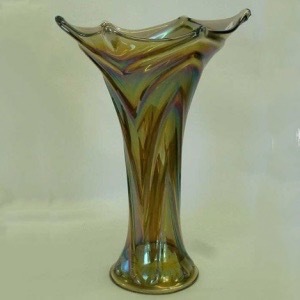 Base diameter for these is 4″, and the heights vary greatly from 10″ to 18″ tall. 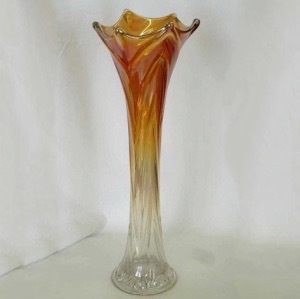 On some the top opening is stretched to over 8″. 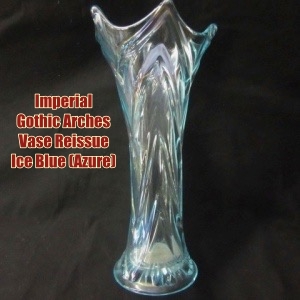 This pattern was reissued by Imperial (after 1960) (see reissue-gotharchvase) and was made in Ice Blue and Yellow – they should be marked with an IG on the base.